my days have been busy. I started my new summer job a few weeks ago and it's been a change of pace in comparison to my school year job. I've been working 40 hour weeks (and in particular the 3-11pm shift the last two weeks) so once I get home at night I'm pretty drained. my schedule switches to days next week where I plan to cram my evenings with homemade meals and lots of photography. I'm shooting my very first wedding in June and I'm starting to get super nervous! Andrew is in town visiting over the next few days so I made my famous~ lemonade (featuring raspberries) and I whipped up these for breakfast tomorrow morning. I fear that the donuts may get soggy but I've put them in the fridge with my fingers crossed that they will stay firm! the leftovers are in the fridge for my roommates when they get home from the movies! I've seen this lovely recipe floating around pinterest lately and really, it's up to you and your imagination to go wild! basically you need a "donut hole" or in canadaland - timbits! plus some seasonal fruit. wash your fruit, skew it onto a stick and ta-da! 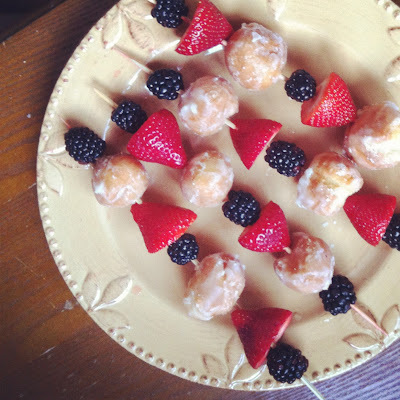 I used old fashioned glazed and sour cream glazed timbits, but I thought chocolate would be a nice change as well. lo and behold, when you go to tim horton's at 7pm, it's rare to find a wide selection of timbits at your disposal. a carton of strawberries and blackberries and 20 timbits later, I had 10 nicely stacked skewers ready to go. I feel like I say it every time, but updating my blog really is on my list of things to frequently do this summer. aside from that, my only other summer goal is to keep my basil plant alive. I think I killed three last summer. I have lots of recipes bookmarked and lots of reasons to bake, so keep your eyes peeled for more refreshing recipes coming your way.